Market Cap: A Gigantic Growth: Cryptocurrencies enter a bear market after a spectacular development in 2017. Beneath the Wave: Besides Bitcoin, there are other cryptocurrency projects that catch our interest. A Ride on the Wave: The phenomenon was beneficial to some other industries. Academia & Wall Street: Cryptocurrencies are looked at very cautiously. Governments: The stance is mitigated but also quite cautious. WHICH REGULATION FOR CRYPTO IN 2018 ? Several areas of the cryptocurrency ecosystem must be regulated: illegal use and tax evasion, Initial Coin Offerings (ICOs) and Exchanges. Since the famous Satoshi Nakamoto’s paper was published a decade ago, entailed by the early interest in the Blockchain technology with Bitcoin on the frontline, 2017 is the year that witnessed the surge of a phenomenon, that some label as a mania, while its advocates call it a revolution for both internet and banking. The spectacular surge in the prices of Bitcoin (BTC), Ether (ETH) and Ripple’s XRP, overshadowed a frenzy of pumps & dumps that finance professionals and economists assimilate to the euphoria of the Internet Bubble as the public is rushing for big return by searching and trading the « next Bitcoin ».Note that over the year, wallet address creation doubled to 21.5 million and in Google Trends, the search word « Bitcoin » overthrew, in the last quarter, topics like « Trump » and « North Korea ». The technicalities of cryptocurrencies being treated by J.-M. Mercier in a previous article In this publication, we present the major developments in the cryptocurrency market in 2017 as well as a reflection on a regulation for this market. Looking into the data provided by www.coinmarketcap.com, 617 cryptocurrencies, tokens and assets were available for trading on the first day of 2017, totaling a market capitalization of 14.Bn euros: Bitcoin is leading the billboard, with a dominance of 87% and a price near 8 hundred euros. Major currencies, such as Ether and Ripple, were traded for the lump sums of 7 euros and 0.05 cents, making up roughly EUR9 million of combined daily volume. The question that comes to one’s mind is: what are the reasons behind this rapid jump? At the early beginning, cryptocurrencies, essentially BTC, where perceived as an alternative to fiat currencies, permitting a superior level of security and anonymity, given the use of sophisticated algorithms in transaction encryption, with no need of a central bank or a monetary authority for regulation. For these reasons, the possession and use of cryptocurrencies was reserved to only a core group of technology enthusiasts and idealistic online communities, mainly attracted to the anti-establishment feature of Bitcoin previously described. Over time, one of the determinant characteristics of Bitcoin played in favor of an increasing demand is rarity: as a matter of fact, the supply of bitcoins by mining is limited to 21 million units. This deflationary condition, as well as the technological potential, increased the interest in purchasing BTC and other cryptos, which lead to the endorsement of renowned investors and influential personalities. Michael Novogratz – former partner in Goldman Sachs and hedge fund manager – and Blythe Masters – renowned for launching the Credit Default Swap market while in JP Morgan, and currently CEO of Digital Asset Holdings LLC – are among many. With the abundance of exchanges, open for trading 24/7 with relative ease, as well as sustained internet advertisement, the general public got more attracted to crypto assets, with Asian investors keeping the lion’s share. At the exception of China, which once represented two thirds of BTC trading volume before a government crackdown, the authorities in Singapore, South Korea and Vietnam displayed a rather neutral to welcoming attitude towards cryptocurrencies. As per Japan, it eased its regulation aiming to become an important hub. Moreover, ads for cryptos are displayed on television and public transports. By the time of writing, JPY is the #1 currency in Bitcoin trades, with more than a third of total volume. The summer selloff: in June, BTC price plunged by no less than 36%, after having tripled since January, driving the whole market down with it. The fall was due to doubts on the performance of Bitcoin as a means for transaction, given its slowness compared to competitors. The Bitcoin blockchain was later “hard-forked” in August, giving birth to a new chain called Bitcoin Cash (BCH). The China crackdown: cryptocurrency market capitalization dwindled by more than a third in mid-September. The reason, this time, was the ban of Initial Coin Offerings (ICOs) and exchanges amid fears of capital outflow. The decision stirred fear, as China represented a very important market share, not to mention the too many “mining farms” located on its soil. 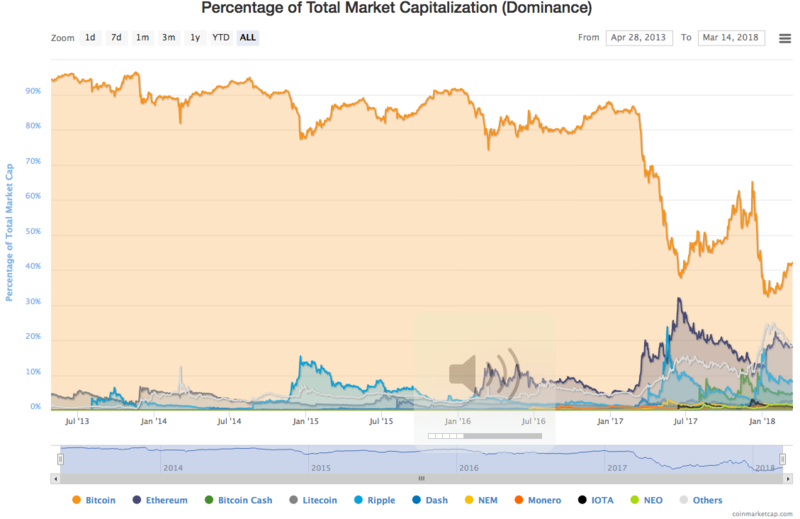 In this paragraph, light will be shed on Bitcoin’s rival: Ethereum, as its adoption is widely increasing as much as its token price, Ether, is steadily growing. Ethereum is a decentralized platform, founded by Vitalik Buterin and Joseph Lubin in 2015, designed to host smart contracts and applications. Ether (ETH) is the cryptocurrency provided by the platform, its function is to compensate nodes for the computing power put in use. In the middle of the cryptocurrency frenzy, Ether seems to be one of the few coins with value deriving from a good reading of fundamentals. And here the fundamentals are all about adoption. And the latter can first be measured by the progress made through the EEA (Ethereum Enterprise Alliance, gathering Blockchain startups, researchers and Fortune 500 firms). The number and quality of applications built on the Ethereum Blockchain, as well as the platform’s roadmap, appear to be very promising. To be noted that among the different implementations of the Ethereum blockchain, we list: potential use in the Brazilian electoral system and securities clearing in France. Not to forget that Ethereum is the Blockchain of choice of 90% of ICOs today. Not to forget the transaction cost, scalability is a serious challenge for blockchains and their cryptocurrencies. Even though Bitcoin has the advantage of the early mover, its high transaction fees come against a wider adoption. Interesting details are covered in this article on Cointelegraph. The Blockchain wave did not create wealth and fame only for coin creators and early adopters. In fact, several companies rode the wave by either creating hardware or integrating Blockchain/Cryptocurrency solutions within their business. On the hardware side, the demand for mining infrastructure bolstered the sales of chipset makers, such as AMD, NVIDIA and TSMC (Apple’s main provider), driving their market value to new highs. However, this growth is to halt or slow down if a regulatory clampdown on mining activities, such as the one considered in China, is applied. Cryptocurrency wallet companies also managed to raise funds and increase sales amid operational risks of theft and hacking. For instance, the French startup Ledger, specialized in securized hardware wallets, raised 7 million dollars in 2017. In January, the company managed to raise no less than 75 million dollars, 5 million above the amount expected. On the other hand, Kodak – once labeled as a bad example in keeping up with technological progress – witnessed a spectacular 200% increase in its share price. The event is explained by the firm’s announcement of using Blockchain to securely watermark pictures taken by photographs. The company also aims to launch its own cryptocurrency in a large scale ICO. Finally, even the InterContinental Exchange, parent company of the NYSE, announced its will launch a service for cryptocurrency market data feed. In the midst of technological adoption and grand price fluctuations, the cryptocurrency phenomenon had public figures speak up, from central bankers to Wall Street CEOs and renowned economists. In this section, light will be shed on the views of financial industry leaders on one hand and governmental and regulatory representatives on the other hand. However, we understand that the common denominator of these views is a recognition of the underlying technological potential, mitigated by caution regarding volatility and the absence of regulation. Economists are the most wary of cryptocurrencies, with Bitcoin the primary target. Another Nobel laureate and former World Bank chief economist, Dr. Joseph Stiglitz, is more radical: he wants Bitcoin outlawed. As the cryptocurrency reached an all-time high in December, the economist underlined the fact that “it doesn’t serve any socially useful function” rather than circumvention, which according to him, can be a sufficient reason for authorities to ban it and hence triggering the collapse of its value. Nonetheless, although cryptocurrency market capitalization is now at the order of hundreds of billions, academics showed no fear of repercussion on financial stability, in a survey initiated by the Centre for Macroeconomics and the Centre for Economic Policy Research. However, we believe that the survey would lead to a different outcome today, given important factors: rumors of bank involvement and the lack of a clear and defined regulatory mechanism. Financial institutions are enthusiastically looking to gear up their infrastructure with the Blockchain, some finance professionals are even shifting to cryptocurrency experiences. On the other side, investment bankers joined first economists in their cautiousness. Jamie Dimon of JP Morgan even labeled Bitcoin as a fraud – which he later regretted publicly in January 2018 – and Lloyd Blankfein chose a more diplomatic and opportunistic stance; the Goldman Sachs’ CEO underlined the fraudster use of cryptocurrency and its high volatility, while being conditionally open to business opportunities within the cryptocurrency ecosystem. As a matter of fact, at the time of printing, Morgan Stanley and Goldman Sachs are the only two banks clearing Bitcoin futures for their clients, with the latter even rumored for setting up a cryptocurrency trading desk within its FICC division. A few States are either curious for nationwide cryptocurrency implementation, such as Estonia, or even willing to fully authorize and detax cryptocurrency trading activities, like Belarus. But globally, decision makers, mainly in the G20, are skeptical and start to look into regulatory solutions, at least to tighten the grip on the use of digital currencies in tax evasion and money laundering. In this section, the different statements of some G20 authorities will be overviewed. The country is to push a joint proposition with Germany in the March G20 summit. According to the Bundesbank director, virtual currency regulation can be effective only through international cooperation (January 2018). The ban of September 2017 caused turmoil and led to a decline in the prices of most crypto assets. The regulation in question concerns the ban of anonymous trading. Two of the biggest exchange thefts occurred in Japan (Coincheck in 2018 and Mt.Gox four years earlier). As a consequence, authorities urged exchanges to reinforce security and protection of customers. Which Regulation for Crypto in 2018? It is clear that the strong and volatile variations of this market underlie these facts: there is an overvaluation of crypto assets, motivated by important returns and fueled by trading becoming mainstream. The risks are increasing accordingly, for retail as well as institutional investors. Therefore, a regulatory and risk management framework must be envisioned to avoid another bubble burst that can be costly to fix, in a period where the global financial markets start to lose steam, and face a potential correction. We assess that the current global approach to cryptocurrencies contains both interest and precaution. However, regulation has not responded yet to the different challenges that arise within this ecosystem. It is true that the size of cryptocurrency spot market is miniscule compared to equity and forex markets, and even smaller than some listed companies, hence, limited systemic risk. But the rapid development and the increasing ties with the traditional financial markets should motivate market participants, industry and regulators to work jointly on financial stability and consumer protection mechanisms. Some governments started already to clamp down on the use of digital currencies in illegal activities, and large exchanges also showed their will to report client holdings. However, money laundering and illegal activities seem persistent. For instance, South Korean authorities uncovered 600M dollar worth of cryptocurrency used illegally. In a testimony before the US Senate on February 6th , SEC chief J.Clayton stated that Initial Coin Offerings are no different than security emission. Hence, this fundraising model must be return to the approval SEC. With 10% at least of funds being raised in fraudulent and Ponzi-like offering plans, the public must be protected from scams by increasing the requirements on public information, and KYC/AML practices. It is worth noting that self-regulation is now considered as a serious option by market participants, with entities like Deloitte CIS, the Ethereum Competencies Centre and the ICO Governing Foundation initiating a self-regulatory body for legal, tax, accounting and due diligence standards for ICOs. With trading volumes unexpectedly increasing, exchanges showed several vulnerabilities: 3 out of 4 exchanges were subject to DDoS attacks in Q3 2017 (including blockchain-based Etherdelta). Outages and recurrent technical issues are also very common. For instance, California-based exchange Kraken, ranked #1 in terms of EUR volume, was shut down for several days early this year after an upgrade release went wrong. Users criticized the lack of transparent and clear communication and it is reported that some traders incurred important losses on their margin positions amid the shutdown. As per fraud within exchanges, traders and investors point to the elephant in the room affording only to fear the worse: Bitfinex and Tether. In a nutshell, Bitfinex is a cryptocurrency exchange and Tether is a cryptocurrency. Both being created by the same entity, with the idea beneath Tether is that it is US Dollar-backed and several cryptocurrencies are quoted against it. With over two billion Tethers in circulation and an astonishing relationship between the amounts of Tethers “printed” and the pumps in Bitcoin value. Until now, an audit of Bitfinex accounts is still questionable and US regulators began recently to scrutinize the matter, with the CFTC issuing a subpoena to Bitfinex. Another prominent US-based exchange, Coinbase, is also doubted within the cryptocurrency community for insider trading practices over Litecoin and Bitcoin Cash. Blockchain and the inherent digital tokens are a very valuable technological innovation indeed. But the financial outcome for cryptocurrency valuation is uncertain, given the mass speculation and the unclear global regulatory stance on this ecosystem. Probably Bitcoin will still be here for decades, but worth only a fraction of its current value, as Dr. Schiller pointed out. Or it could multiply its value by hundreds, as technology pioneer John McAfee predicts. Until then, the challenge of 2018 for cryptocurrencies is to learn from the vulnerabilities of the financial system that they are willing to replace: fair valuation models, risk management tools and a regulatory framework to protect investors.